DMHS Smartphone Application | New Design Group Inc.
Durham Mental Health Services (DMHS)is a leading mental health services provider located near Toronto which offers free and confidential mental health services and operates as a not-for-profit agency. DMHS had previously hired New Design Group for a rebranding project to show people living with mental illness that they were a caring and highly professional organisation which people could turn to in times of need. As the number of website visits and social media engagement increased, the forward thinking CEO, Rob Adams realised that many people with mental health concerns use online resources to find advice. New Design Group were hired to develop this new app. Two apps were required- one for an Android platform and one for IOS. To reduce development times and to stay within a tight budget, New Design Group decided to use a cross-platform environment which allowed one app to be built and then compiled for each platform. It was important to have a clear statement that the app was not a substitute for medical or professional care – hence a clear disclaimer statement is shown when first using the app. 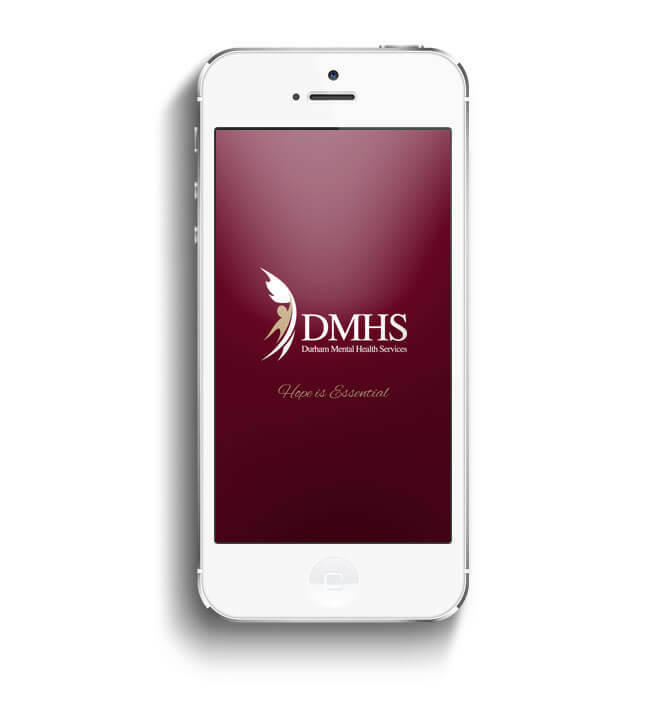 New Design Group designed the app so that the information was clearly displayed on a small screen, whilst also utilising key elements of the DMHS brand, namely the logo and colour palette. All of the content was carefully created in conjunction with DMHS to ensure the right messages are conveyed to the user, and both the DMHS phone number and website address are shown clearly on each screen. New Design Group are working on a separating the current app into two – one native Android and one native IOS. Additionally the updated app will include the functionality of the DMHS safety plan to enable users to keep their coping strategies updated on their smart phones. 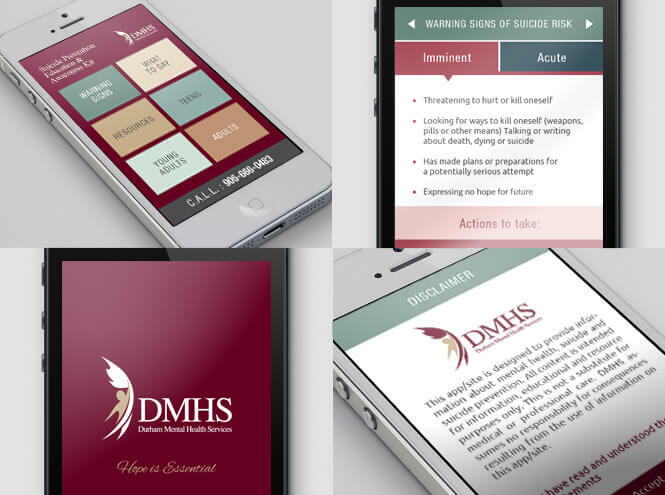 Not only does the DMHS Suicide Prevention app offer those living with mental illness concerns immediate support and guidance, but it shows DMHS as a positive and professional role model with the area of mental health services. The DMHS Suicide Prevention app is available for download on Google Play.